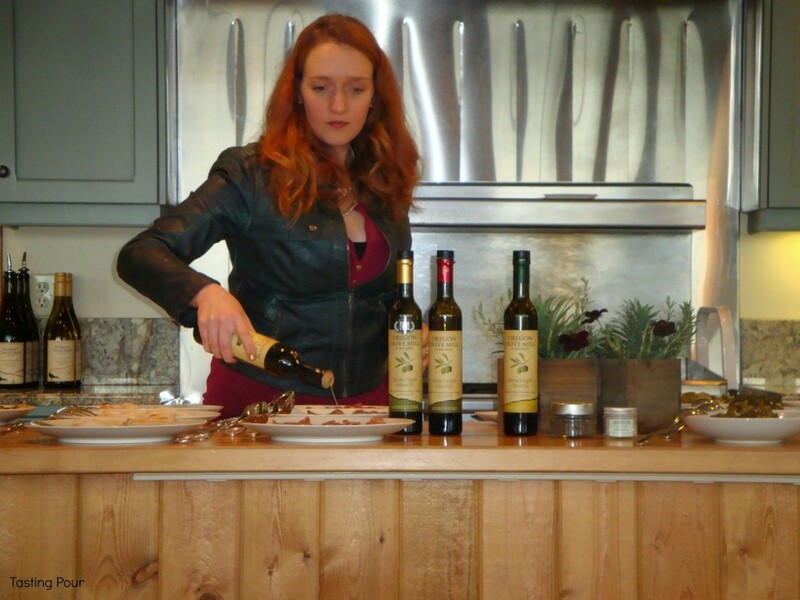 On a recent visit to the Oregon Olive Mill and Durant Vineyards at Red Ridge Farms we were delighted to learn there is a fun technique to olive oil tasting, not unlike wine tasting. Libby Clow, Olive Oil Program Ambassador, explained the steps. 1. 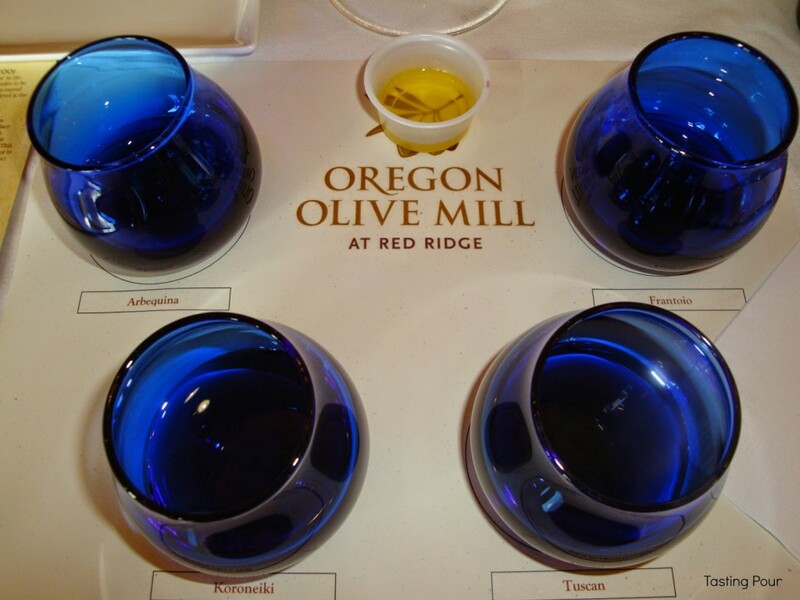 Appearance – Unlike wine tasting, olive oil tasting is done in blue opaque glasses. The color doesn’t give hints about the taste but can result in misleading preconceptions. For instance a very green olive oil may taste more buttery than grassy. 2. Don’t swirl it, heat it up – Just like wine releases aromas when it interacts with air, olive oil “opens up” with heat. Think about how much stronger olive oil smells when it hits a hot skillet or when drizzled over steamy vegetables. We placed our stemless glasses in our palms, covered with our other palm, and twisted back and forth to warm the oil. 3. Sniff – Here is where wine tasting and olive oil tasting begin to intersect. While wine professionals describe aromas in terms of tree fruits, stone fruits, earth, etc. Olive oil experts are looking for aromas and flavors in three categories: fruit, bitterness, and pungency. 4. Slurp – Yes we DRANK our olive oil! Just a sip and then we drew air into our mouths just like wine tasting. We discovered fruity and floral flavors like apple, avocado, chamomile; bitterness like walnut skin and arugula; and pungency like black pepper and jalapeno. If you try these steps, and you can for free at Oregon Olive Mill, you might find yourself coughing at the end. According to Clow, the pepperiness in the back of your throat is an indication that the oil is still lively. This is an individual response and can be more pronounced for some people. 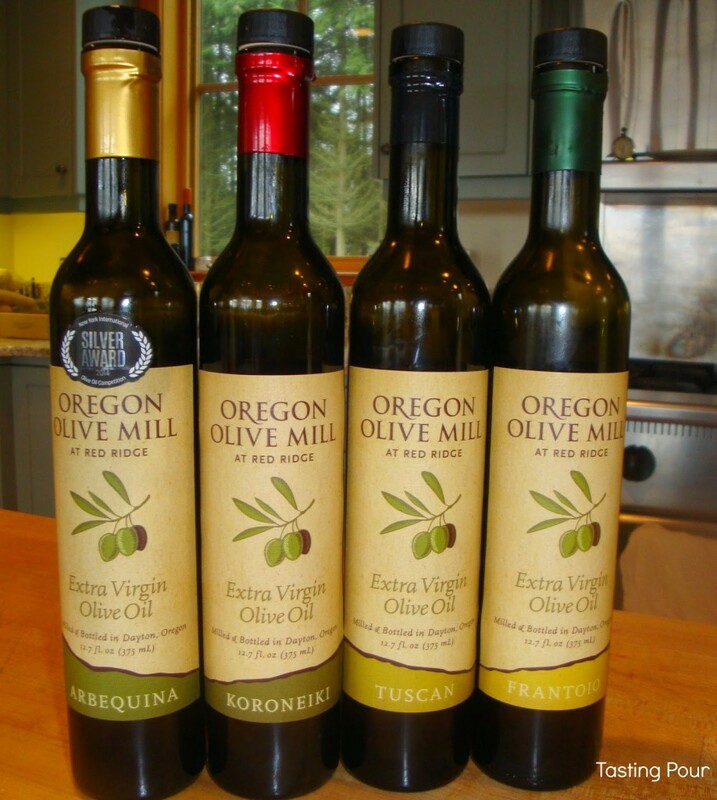 Quality olive oils are often made with just one type of olive and it will be listed on the label just like a wine label lists “chardonnay.” At Oregon Olive Mill we tasted Arbequina, Frantoio, and Koroneiki. Labels often list harvest and bottling dates. Filtered oils have a shelf life of 2 years. Once opened expect them to stay fresh about 6 months. Just like wine, they should be stored in a cool, dark place. A kitchen cabinet away from the stove and fridge is a good place to keep olive oil. Olive oil doesn’t just keep your cast iron happy. It can add flavors and textures to your dish. What about adding an oil with flavors of orange peel and a buttery texture to a crisp arugula salad?For our tasting, simply prepared foods were drizzled with various olive oils. Frantoio, buttery textured with flavors of celery leaf, was lively enough for roasted potatoes and subtle enough for cheddar cheese. 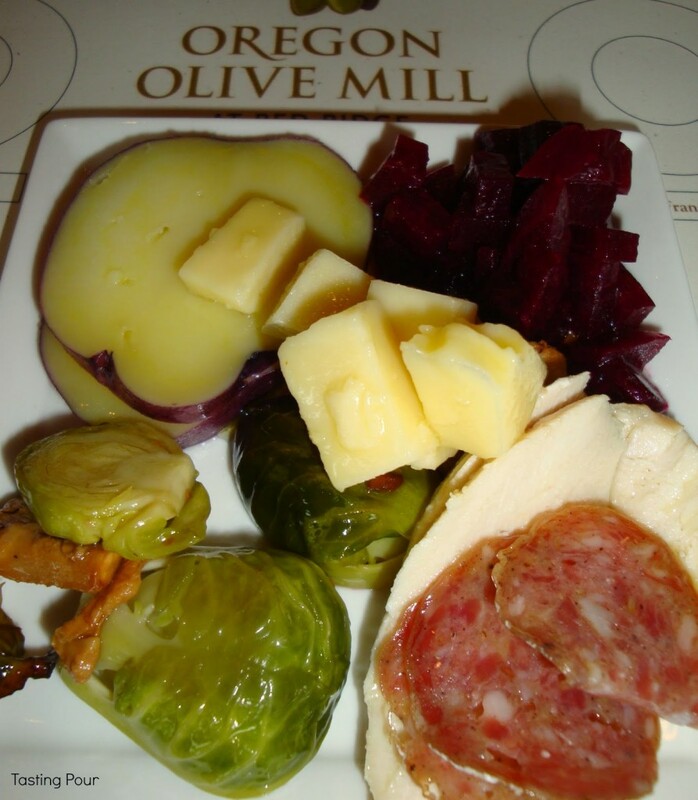 Tuscan, the only olive oil we tasted made from a mix of olives, was versatile enough for both salami and brussel sprouts. Arbequina, had a creamy avocado texture, flavors of bitter almond and green banana. It was a great addition to roasted beets. Koroneiki had the most tannin, viscosity, and depth of flavor. A popular olive oil for meats, it was drizzled on poached chicken. Ever heard you are not supposed to cook with olive oil at high temperatures because it is toxic? According to Clow this is a myth perpetuated by the producers of other cooking fats. It is true olive oil has a lower smoke point (420 vs 450 for canola oil) but the only danger is a little decrease in flavor. Fine olive oil is packed with more flavor and health giving properties than any mass produced canola oil. Most of us are not going to have an arsenal of oils for different dishes. If you do, please invite Tasting Pour over. We will bring wine. Choosing olive oil is like choosing wine. Find a quality product you like and it will be a good pairing. Guests get to enjoy the fruits of the Durant family’s labor. Visitors walk through the green house and nursery running their fingers through the various scented mints and lavender. 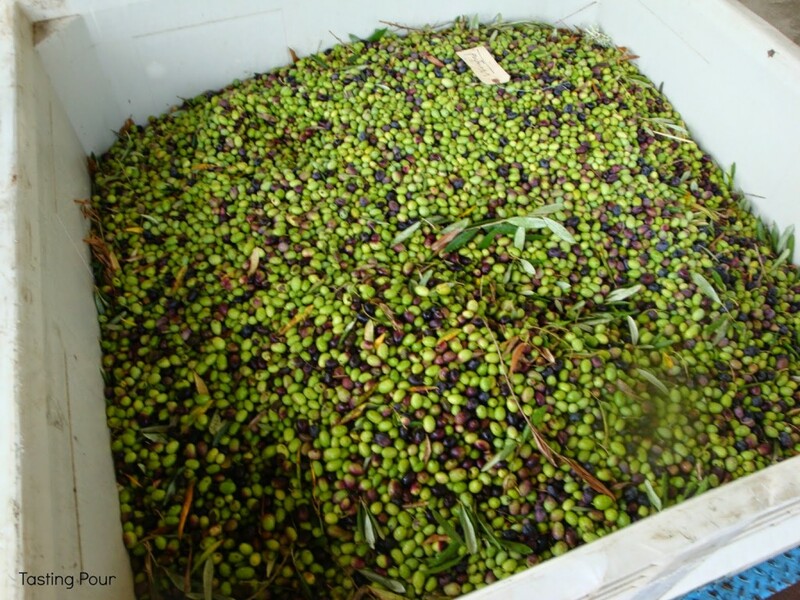 Olive oil tastings are free and so are olive mill tours with a reservation. The gift shop is an inviting space with many products based on honey, lavender, and of course olive oil. Outdoor seating is located by the gift shop and outside the wine tasting room. 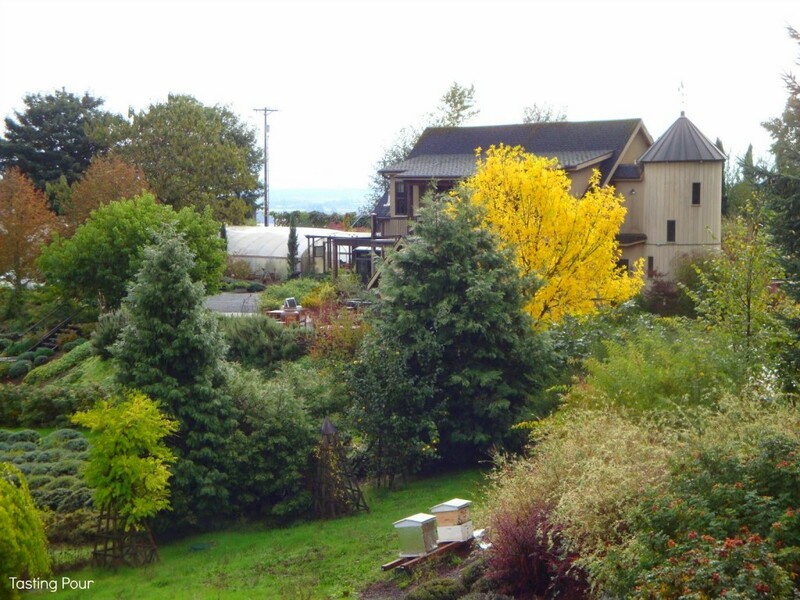 If we could only take guests to one vineyard in Dundee Hills this is the one we would choose. Our parents, who don’t drink, recently visited. They loved the views, nursery, gift shop and olive oil. There is something for everyone. For those who do imbibe, the wine is not to be missed. For more information on Durant Vineyards wines Farming Comes First at Durant Vineyards. 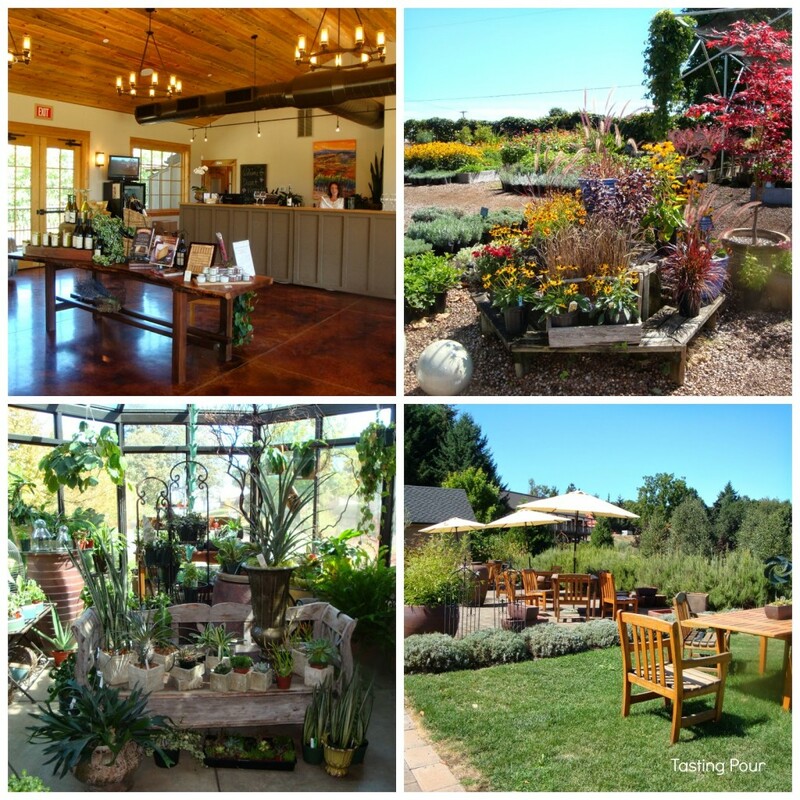 For more information on wine and olive oil tastings visit Red Ridge Farms. Have you found a fabulous olive oil? Tell us about it. Oh, and here is the cookie recipe as promised. 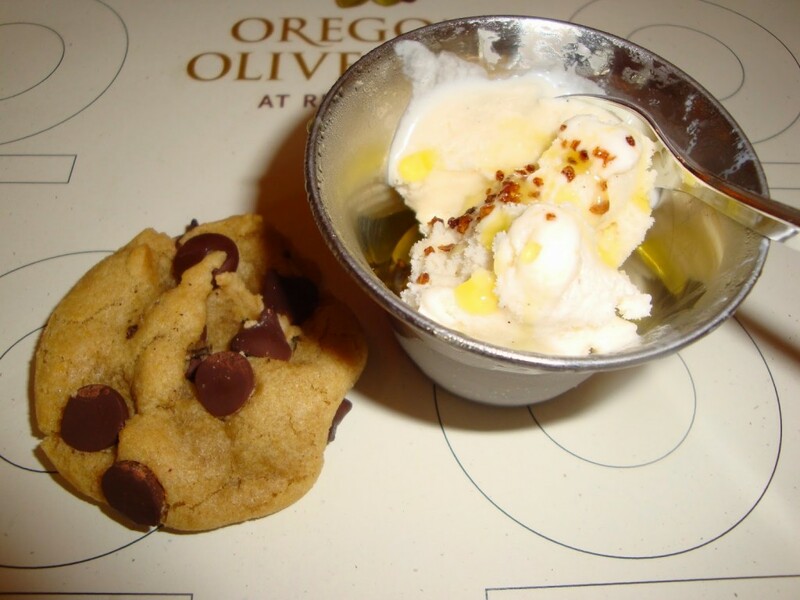 For friends who can't have butter try this delicious chocolate chip cookie made with Oregon Olive Mill olive oil. Add both sugars, salt and vanilla to bowl with Extra Virgin Olive Oil and whisk until fully incorporated. Add egg and yolk and whisk until mixture is smooth with no sugar lumps remaining, about 30 seconds. Let mixture stand for 3 minutes, then whisk for 30 seconds. Repeat process of resting and whisking 2 more times until mixture is thick, smooth and shiny. Using rubber spatula or wooden spoon, stir in flour mixture until just combined, about 1 minute. Stir in chocolate chips and nuts (if using), giving dough final stir to ensure no flour pockets remain. Using a tablespoon, scoop out as much cookie dough as necessary to make the size of cookies you desire. I did one big tablespoon for each cookie, which equaled to 2-sheets of 12 cookies. Bake cookies 1 tray at a time until cookies are golden brown and still puffy, and edges have begun to set but centers are still soft, 13-15 minutes. Transfer baking sheet to wire rack; and allow cookies to cool. This recipe is Olive Oregon Mill's adaptation of Cook’s Illustrated Thick & Chewy Chocolate Chip Cookie Recipe. Sounds like fun! Love a good olive oil. It was fun, David. Olive oil can really enhance a dish. A whole new layer of pairing. I loved learning about olive oil and tasting lots of different oils!! This is a great post.